on the outside, we're your typical happy family who loves spending time together. soccer, baseball, football, biking, camping, school, church, we do it all. from the pictures, it appears we're the perfect family. and we are, it just depends on your definition of perfect. if you think perfect is normal, then no, not so much. but if you think perfect is just what God intended, even if that means an incredibly frustrating attempt to teach kids how to love that is met with resistance and fear and not knowing how to even go about doing that in the first place and trying to figure it out while years are passing by and you fear you'll never reach them in time, then yeah, we're perfect! 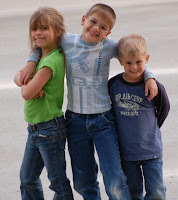 cj (8) was adopted at 20 months and has no attachment issues despite spending almost 2 years in an orphanage in ukraine. em (8) and mr (7) were adopted at 6 and 3 after being raised (term used loosely) by their sucky parents and both have been diagnosed with RAD. sadly this shows that no parents at all can be better than sucky ones. em and mr were extremely neglected, which has affected their brain development. so while they are very intelligent, cute, and happy on the outside, they are really messed up little kids on the inside. so these are our three who complete our family and make our adventure possible! if you're learning about being RADical family, click here for help!